We recently did some big kid improvements to our house. Or rather, the outside of our house. Every winter we talk about how we’re going to landscape in the spring. Every fall we talk about how we should have someone come give us an estimate and plan and then we’ll do it ourselves. See the trend? Every year we don’t do one single thing to landscape. A couple of years we bought planters and potted plants. It was an attempt but never enough to push us over the edge. Or, brick ledge. Heh. It went slower than I expected. Much.slower.than.I.expected. This first hole was dug at 6 pm Saturday night. Let’s just call this the beginning of the end for Maximus and his sleep schedules. Bryan dug 1/4 of the wall line that first night. He may have been out there at dusk with the front light on while Maximus stood looking out his window. 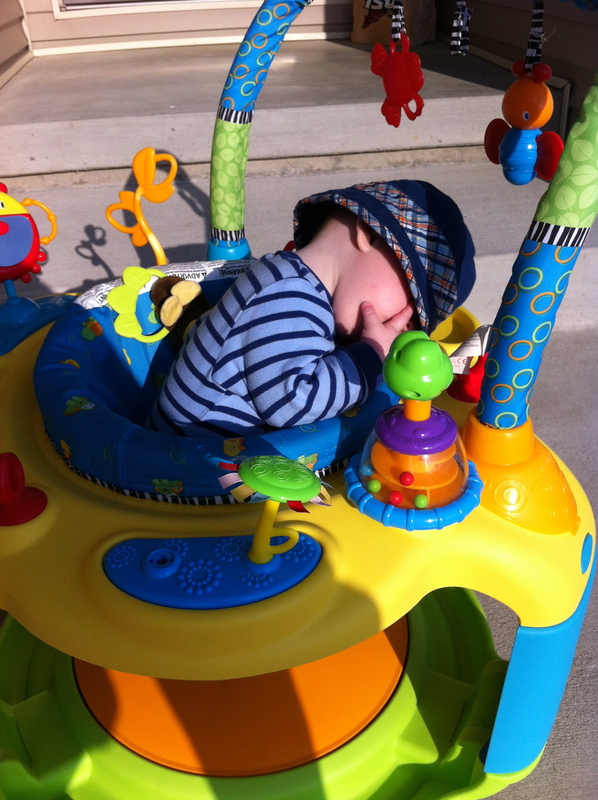 Then, of course, it rained Sunday morning so Bryan couldn’t get back out there until nap time. You know where this is going? Maximus didn’t take a nap, he stood at the window and watched for two hours. 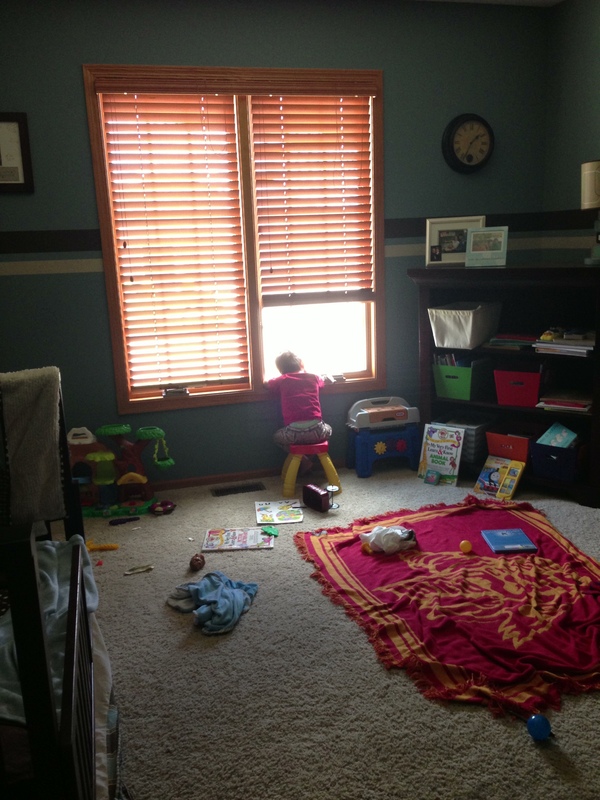 For a better visual, his blinds were drawn so he tucked himself between the blinds and the window with his face pressed up against the screen. (That’s his window in the picture below.) Talking to us at times. Rinse and repeat during bedtime that night. On Sunday, Bryan made it halfway along the line and hit the first curve. He spent evenings working a little further and was finished with the brick by the next Saturday. I didn’t realize how much it took to do a wall. 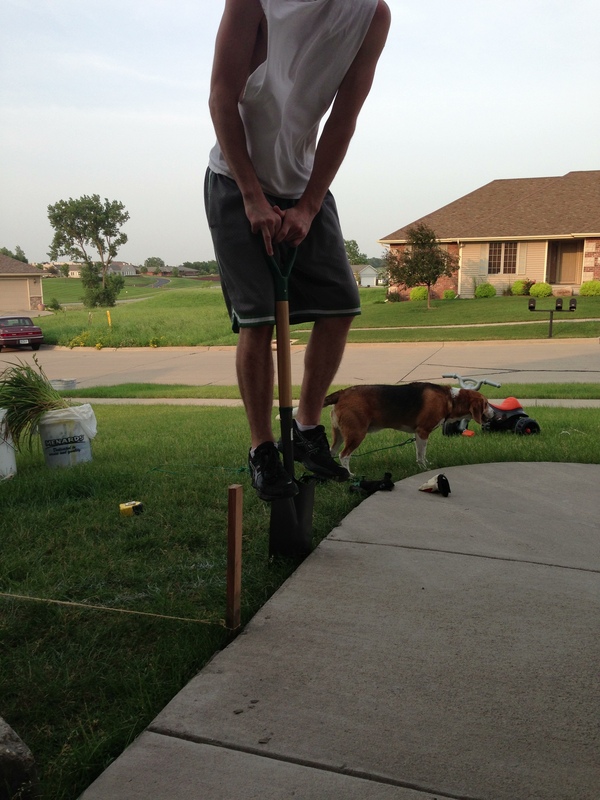 He made it level with the sidewalk so he had to use multiple levels. I knew he’d have to dig out dirt, but I didn’t think about making the ground level. We didn’t put sand down, but did put pea gravel down. Then put down the bricks and work to make them level and even with the sidewalk. Once that was complete, he’d move on to the next one. Then he had to make sure the two together were level so he ensured that he kept with the sidewalk level. He got about four bricks in before he had to step down a level and put one brick in the dirt. So on and so forth as the ground sloped downward. I told you, lots of work and planning went in to it. Have you noticed that I keep saying he or Bryan? That’s because things progressed so slowly that I couldn’t be any help. 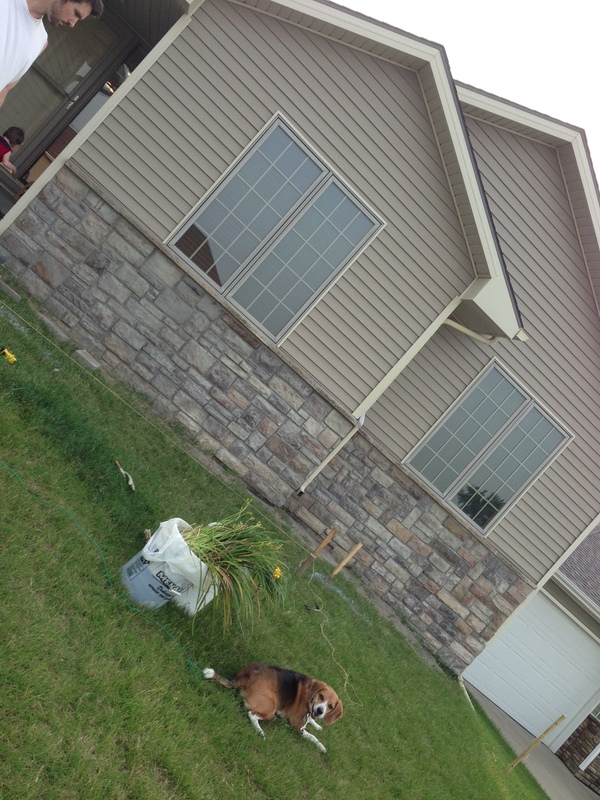 I carried brick out of the garage and I put pea gravel down, but I was little help beyond that. I did watch over the babies, so I suppose that was my contribution. After the second day of work, he decided that he wanted to glue as he went so he went back and glued the pieces down real quick. After getting everything in place, he rented a wet saw and cut the top pieces. He flew through that on Saturday afternoon and was able to glue them down on Sunday. One week after he started the project, he finished! After a week of dealing with late bed times, I gave up on the weekend nap. I pulled up his blinds and suggested he pull up a chair for the final brick work. After the brick was complete, we had to bring in two trailers of dirt to fill in the area. 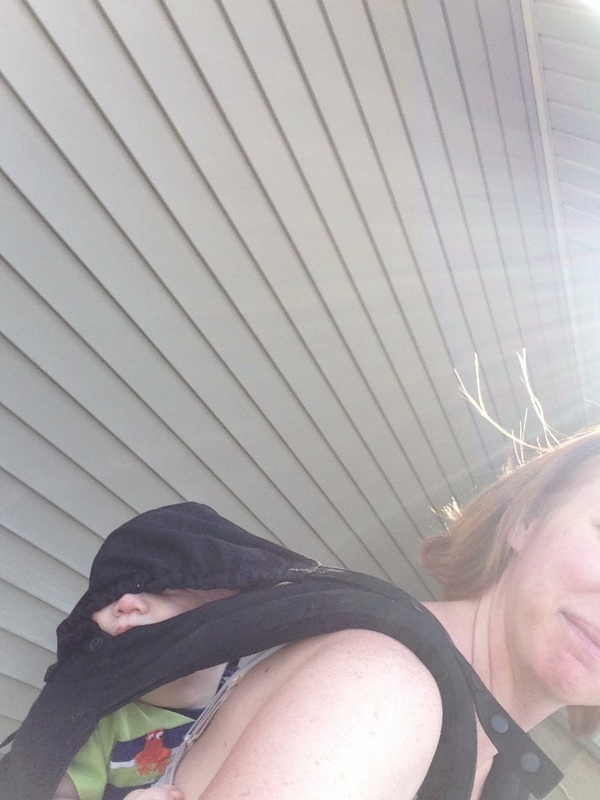 At that point, Maximus walked outside with his shoes, hat, and sunglasses on and wanted to know what we were doing. 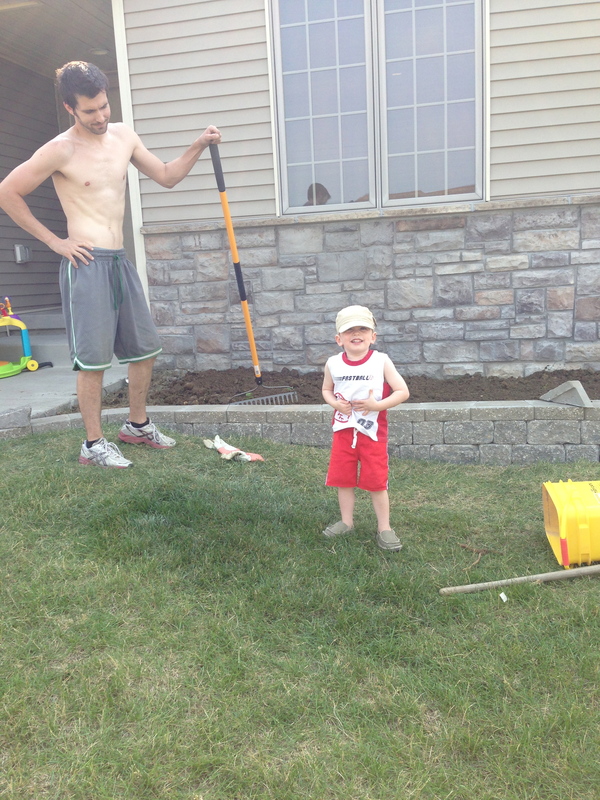 Bryan put him to work with a small shovel and he provided minimal help but made lots of messes. This was a point where I was actually able to help, even though I had a “helper” who had exhausted his love for the exersaucer. If you look closely, he’s taking a nap! After we got the dirt in, we put down the weed paper and called it a weekend. 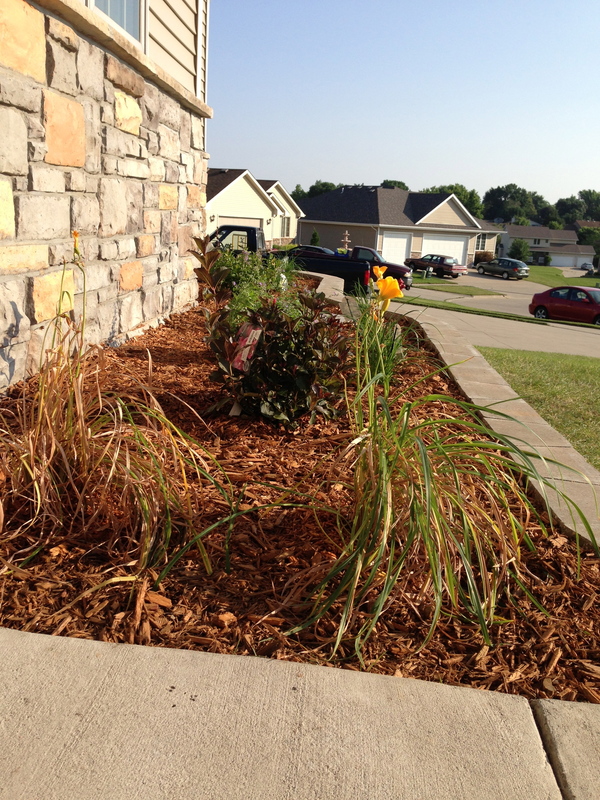 Weeks are crazy around our house, so one night we had a free 45 minute window so we quickly bought plants and mulch. I was very impressed that we only spent 40 minutes at the store even though we had no idea what we were doing! Thankfully we had an extremely helpful associate who understood Bryan’s drawing and told us where to put everything. The following night we had a spare hour so we quickly planted them. The mulch had to wait until Thursday morning. We woke up with Quinten at 6 and I was outside working at 6:55. I’m still waiting for my medal, but I think it was lost in the mail. Maximus came outside around 7:30 with messy hair and sleep in his eyes. “Whacha doing guys?” Well, Quinten is sleeping and we’re putting mulch down. It was a whirlwind project and Bryan worked very hard to get it done. He put a lot of sweat into this project and got a few blisters on his fingers. I think he got to know his level on a whole new…level. Heh. I absolutely LOVE the landscaping and want to spend all my time in the front yard. I can’t believe how much it changes the feel of the front yard. And best of all, we came in under budget by about $20! 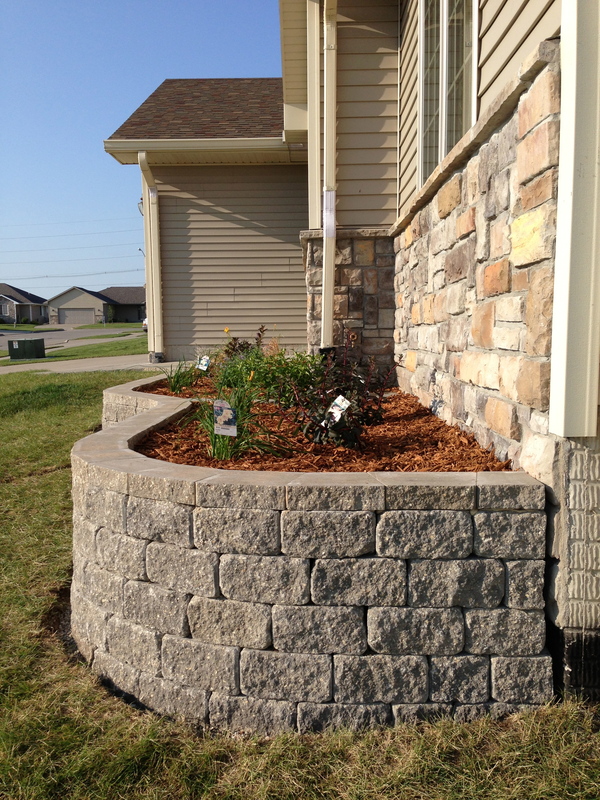 This entry was posted in Family, Maximus, Milestones, Quinten and tagged DIY landscaping, Home improvement projects, Home ownership by Kyley Leger. Bookmark the permalink.